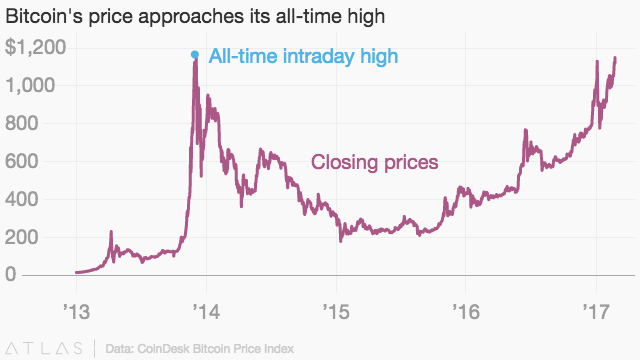 In what is becoming a familiar refrain, bitcoin is surging towards a record price. It’s trading at around $1,145 today, based on the CoinDesk Bitcoin Price Index, which puts it $20 off its all-time high of $1,165, achieved on Nov. 30, 2014. Chatter in the markets is dominated by talk of a looming deadline for a decision by the US Securities Exchange Commission on a bitcoin exchange-traded fund (ETF) proposed by the Winklevoss twins, the internet and venture capital duo famous for suing Mark Zuckerberg for allegedly stealing their idea to create Facebook. If approved, the ETF would enable institutional buyers to easily offer the cryptocurrency to consumers, potentially unleashing a flood of liquidity and demand for bitcoin into the markets. The SEC has until March 11 (pdf) to make a decision—there is even a prediction market for traders to bet on the SEC’s decision. Bitcoin’s price has been surprisingly resilient in recent months, surging upwards even with an official clampdown by China’s central bank in place that has led to restrictions at Chinese exchanges, once the major source of trading volume in the cryptocurrency. Chinese traders are finding new ways to exchange bitcoin and yuan, including through peer-to-peer networks. Japanese exchanges are also reporting increased volumes, although those figures are likely inflated because platforms there allow users to trade without charging a fee; the same reason why Chinese exchange volumes used to dominate the global market.